After nearly 15 years of innovation, it can be safely argued that the E-Commerce industry has found a stable orbit around a core set of best practices. Every product imaginable has been pushed online, some selling with great success, others with lackluster results; but the collective effort has revealed what works, what doesn't and even more importantly, what opportunity for innovation still remains. The most fertile E-Commerce territory has been long staked out and farmed and nowhere is this more apparent than in the retail market for books, DVD's and other relatively simple products. Indeed, early success stories on the Internet were oriented around the sale of simple products those whose brick-and-mortar purchasing processes could be most easily transferred into an Internet-based environment. Consumers accustomed to the pick-and-pay experience of the conventional retail store quickly adapted to the shopping cart metaphor of early E-Commerce sites. That metaphor has come to dominate the themes of E-Commerce best practices. Frustrated by the success of early E-Commerce sites were those companies trying to sell products that didn't quite fit into the straightforward pick-and-pay experience, in which certain product characteristics weren't easily accommodated by the software available at the time. So-called complex products were challenging to sell because, well, they were complex. Window blinds, industrial mats, custom-cut boxes and made-to-order cable are just a few examples of products that are complex and more difficult to sell than familiar consumer-aimed products. Although it's natural to define a complex product as one having product variations such as size or color, it isn't just product variations that make a product complex. In the early days, online merchants quickly developed ways to sell consumer products that had variations, so that a consumer could select the correct size shoe, or the desired size and color shirt. But merchants in the industrial sector found it much more challenging because of the complex nature of not just the product variations, but the underlying pricing models. Unable to make effective use of off-the-shelf E-Commerce solutions, many merchants selling complex products developed their own in-house solutions, some with great success. And innovative tools continue to be developed by forward-thinking merchants who want to find better ways to sell complex products. Now that the market for simple products has been fully developed, the best growth opportunities for selling online may well lie in the developing world of complex products. Companies that can figure out how to effectively sell complex products can gain a significant market edge over competitors. The differentiation between simple and complex products is somewhat fuzzy, and there are several competing definitions for what makes a product complex. Generally speaking, however, a simple product is one that typically has 1) few variations and 2) simple pricing. Examples include books, shoes, hats, DVD's and the majority of consumer products. Complex products are defined by 1) many variations and 2) complex pricing. In the industrial marketplace, it is common for one type of product to have hundreds of slight variations, and for merchants to offer volume pricing. An ordinary bolt, for example, may have variations in diameter, length, head type, thread type, metal type, etc. The same bolt may have four columns of volume pricing, offering preferential pricing for customers who order in large quantities. Furthermore, complex products often have pricing that is calculated per bulk measure rather than per piece, as is the case for cable sold by the linear foot, or steel sheet sold by the square meter. These types of variation and pricing complexities make it difficult for merchants, especially smallto- mid-sized merchants, to effectively sell these types of products online. There are two classes of tools that have emerged independently among online merchants, both of which have broad applications in the sale of complex products. Often confused with one another, product configurators and product condensers both simplify the presentation and selection of complex products, but in different ways. A product configurator allows a customer to select options for a product in a way that's intuitive, the end result being a personalized product that can then be added to a shopping cart and purchased. 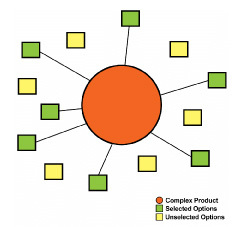 Configurators are used when there are so many options associated with a product that: 1) standard E-Commerce solutions cannot be easily applied and 2) it would be fruitless to treat each unique combination of options as a separate SKU. Also, configurators allow merchants to make the options interdependent, so that the selection of one option determines the allowable selection of other options. One of the earliest configurators was Dell's E-Commerce site which allowed customers to select desired options and, in effect, build their own computer online. Because the selection of one piece of hardware might preclude the selection of another, the configurator needed to recognize the relationship between the various options. Configurators allow merchants to offer highly customized products in a way that cannot be accomplished by off-the-shelf E-Commerce software. In fact, merchants often build configurators for a single type product, specifically tailored for the characteristics of that product. Configurators for Product Discovery Some merchants use configurators as product navigators, fulfilling the role of an offline sales consultant in which the customer specifies general requirements, and a list of products meeting those requirements is presented. A customer using a configurator to find a suitable type of industrial hose, for example, could specify certain characteristics such as diameter, operating environment and application; the configurator would then present the full range of perhaps a dozen or so suitable products based upon the configurator entries. In more recent applications, configurators are used as part of online quotation systems, in which a customer configures a product with the desired options, and submits it to the merchant as a request for quote. The merchant is then able to build a quote on the configured item and send it to the customer via email. Product condensers are different than configurators in that they provide customers with a convenient means to select from a large number of related products. As mentioned previously, many products in the industrial marketplace have slightly different characteristics from one another, but are sold under separate SKU's. Typically, online merchants will list all of the SKU's in large tables, forcing the customer to scan each table to locate a particular product. A product condenser takes all of these related products and condenses them down into a single object, which is then displayed for the customer. The customer then selects the characteristics that they want, and after they have finished, the product associated with those characteristics is displayed, along with the correct SKU and pricing. From the customer perspective, there is only a single product - they select the desired variations and move through the purchasing process. This is much more efficient than scanning through dozens or even hundreds of rows of mind-numbingly similar products. The primary advantage of a product condenser is that it significantly reduces the clutter on a web page, and provides an intuitive interface for customers to choose from a large number of products. Take the case of a merchant selling various types of bolts, for example. Their web site may list hundreds of different styles of bolts, each of which also has slight variations in diameter, head type, thread type, length, etc. In a traditional paper-based catalog, each of the slight variations would typically be listed as a separate row in a large table. However, using a product condenser on a web page allows all of the related SKU's to be 'squeezed' into a single object that appears on the web page. 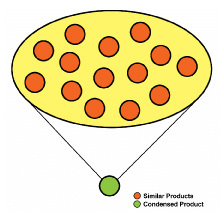 In short, many products are condensed into a single product. In order to purchase the product, the customer is first directed to select a diameter, which triggers the display of available lengths. Selecting one of the lengths triggers the display of available head types, and so on. When the customer has selected all required variations, the product's 'Buy Now' button becomes visible, making the product available for purchase. Also, the specific SKU and pricing for the selected variations is displayed. All of this occurs in real-time, driven by embedded code within the web page itself. There are no server requests, thus, no delays in the product selection process. Product condensers respect the interdependencies between product variations, ensuring that the customer can't purchase a combination of variations that isn't available. Also, product condensers can handle more advanced situations in which the product is sold by units of measure such as by linear foot or by square meter. At the appropriate stage in the selection process, the customer is prompted to enter in a measure, which is validated in real-time for adherence to allowable minimum, maximum and incremental values. Thus, the merchant could sell cable by the foot, specifying a minimum length of 5 feet, a maximum length of 250 feet, and lengths in increments of 2 feet. In the marketplace for E-Commerce tools, the development of product configurators is somewhat ahead of product condensers, and there continues to be some overlap in how each is best applied in actual practice. When faced with the need to simplify the presentation of complex products, eBusiness managers should consider whether they are dealing with 1) a single product with lots of options or 2) many products that are highly similar. A product configurator is best applied to a single product with many options, while a product condenser is best applied to a group of highly related products. Looking ahead at new opportunities in E-Commerce, the adoption of methods for selling complex products should rank high in the minds of eBusiness managers, since that is where the fastest growth is likely to occur in coming years. Product configurators and product condensers are an integral part of strategies for selling complex products online. Clifford Barney is an Executive E-Commerce Consultant specializing in complex products. He is also the managing partner of Red Door Software, a software development firm that develops ECommerce tools for the industrial sector. He recently filed a patent on an advanced E-Commerce system for selling complex products, and is writing a book entitled 'Selling Complex Products on the Internet'. He can be reached at cbarney@reddoorsoftware.com. A complex product with many available options can be more efficiently sold using a product configurator. This allows customers to select options using an intuitive interface, which automatically prevents incompatible options from being simultaneously selected. The configured product can then be purchased using a conventional E-Commerce shopping cart system. When there are many products that are substantially similar, a product condenser is an effective method of simplifying the buying process for customers. Instead of browsing through dozens or hundreds of rows of products with only slight variations from one another, a product condenser provides an intuitive interface for selecting variations, arriving at a single product. The product can then be purchased using a conventional E-Commerce shopping cart system. © 2007-2008 Red Door Software, LLC. All rights reserved.